Although the Nusa Islands can seem like a world away from Bali, it is relatively quick and easy to get there from the mainland. All of the transportation is easily arranged by Ceningan Resort staff so you can just sit back and enjoy the journey! Learn how to make the trip out to our beautiful island home in 4 easy steps from one of our own divers! We left our bags near the walkway where they were soon picked up by the staff and taken away to be loaded onto the boat. Meanwhile, we were greeted by the customer service team and checked in. We completed a form outlining our information and trip details before receiving a sticker. Oddly, the sticker was for the people rather than the luggage, and was delicately placed on the chest of whomever wished in each party. Once our check in was complete (10 mins later) we had a seat under the shaded waiting area until boarding commenced. We had already eaten breakfast and brought water along, but for anyone that was looking to kill some time or grab a bite, there were endless options along the walkway to pick up some food or entertainment before departure. Around 10:00 am we were all told to head to the boat for boarding. Most of the time the boat was located a very short distance from the stall, but with the tide being particularly low that morning, we made a short trek down the walkway to a slightly further departure point. We were thankful the crew had already taken our bags which made the walk a much more pleasant experience. As we prepared to transition from the beach into the shallows, there was a crate put out to collect our footwear. Once we placed our sandals inside, we walked into the shallow water (no higher than my knees) to hop on board. The boat was well cared for with comfy seating both inside and along the back of the boat. We sat along the back to enjoy the fresh sea breeze and views, although an indoor seat would be a great way to sit with your group and watch the action along the way. was a bit unsure about the boat’s capacity to carry the many passengers that kept filing in, but the size of vessel was deceiving as everyone had a plenty of space to themselves. Our trip was very smooth and quick, although I have been told that when the rainy season descends, the swell becomes much larger and the ride can be a bit more rocky. If in doubt, I would recommend taking some seasickness pills if you are prone to that. The trip felt faster than I expected, it was just over 30 minutes from mainland to Mushroom Bay. Being at the back of the boat made disembarking hassle free and gave us a chance to enjoy the lovely view of the bay. The water is a wonderful aquamarine and the short walk through the shallows to the beach was wonderfully refreshing. We collected our sandals and walked up to the seawall to wait for the bags to arrive. We had some time to take some photos and relax while the remaining passengers filed off. I was amazed by the strength and precision with which the crew shuttled our belongings from the boat up to the road. Not only were they careful to keep everything dry, but the whole boat was unloaded in a matter of 15 minutes! You could definitely tell they knew what they were doing. Once we retrieved all of our belongings, we followed the crowd down a short road to a covered waiting area. A truck would arrive with a covered box outfitted as bench seating in the back and would unload their guests. Once unloaded, the Marlin staff would come forward and retrieve guests for certain destinations from their list. The staff would then take the luggage and find spaces under the benches or on top of the canopy for everyone’s belongings before we loaded ourselves onto the seats. We had room for 10 people in the back, 5 on each bench and one or two spots in the cab. I am always amazed by the skills that drivers exhibit in Bali, fitting down roads that look like one-way lanes past motorbikes, pedestrians and even other vehicles. The ride was fun, similar to an adventure off-road ride we had been part of in Mexico a few years before. It was a short drive that gave us a chance to see a section of Nusa Lembongan before continuing our journey to Nusa Ceningan. After our short ride, we arrived at our last checkpoint, unloading ourselves and our gear from the truck. Two Ceningan Resort staff, Komang and Made were waiting for us and helped to bring our gear over to their bikes. I was quite skeptical that we could fit four people, and 6 bags onto two scooters, but the staff expertly balanced everything for the short ride. It was exciting to cross over the famous yellow bridge and enjoy the views of the channel below. The resort was not far from the bridge, but enough to give a secluded, peaceful atmosphere. We parked the bikes and made the short walk to the Mangrove restaurant beyond. The grounds were a lush green and the channel was surprisingly close and accessible. We could see the many mangrove roots sticking up from the muddy bottom, and found out that if the tide had not been so low, a boat would have picked us up from the bridge and carried us to the private jetty. I was happy to take the bikes, passing the many shops and restaurants along the way though. We were soon seated at the Phoenix Bar and given welcome drinks of watermelon, lime and pineapple juices with fresh mint infused throughout. It was not only delicious, but very much welcome on the hot, sunny afternoon. We were introduced to one of the bartenders, Wayan, who took us through a welcome orientation for the resort. He explained the layout of the site including the restaurant, lounge, bar, bungalows and washrooms. We were also informed of safety protocols regarding earthquakes which was appreciated since we had no prior experience. The billing options were explained, and we were thankful there was an option to have an ongoing tab for food and drinks, rather than paying multiple bills throughout. We were also given a map of the island and Wayan explained the many attractions in the area. We were then shown to our bungalow and had a chance to relax and recharge after an exciting morning! All in all, the process was smooth and didn’t end up eating into our vacation time as I had worried it would. The cost is very reasonable, at 300,000 IRP one way, or 550,000 IRP return per person and we were able to pay the resort directly so all of our bills were conveniently tracked in one spot. Not only did that include the fast boat transport, but also the pick-up on Bali mainland and Nusa Lembongan. If you have a different schedule or wanted to explore different companies, there are over a dozen that make trips to and from Bali. Many travellers opt to do a joint trip from Bali to the Nusas then on to the Gilis or the reverse starting in Lombok. There are fast boat operators that go between the islands and a quick google search will provide a listing of options for you to browse. Ceningan Resort tends to use Eka Jaya Fast Boat for guests hoping to make the journey north to the Gilis and the trip takes approximately 4 hours by boat. 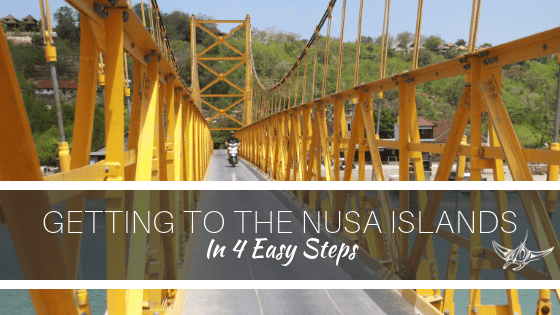 If you are staying somewhere on the Nusa Islands, be sure to check with your accommodation staff first to see if that can be arranged for you, it definitely makes the journey easier!